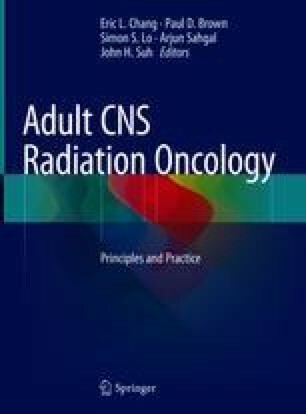 In a limited prospective data environment of skull base tumors including olfactory neuroblastoma, chordoma, chondrosarcoma, and jugulotympanic paraganglioma, this chapter tries to summarize the worldwide experience from initial admission to follow-up covering the up-to-date multimodality management options of adjuvant, definitive, or palliative intent radiotherapy along with the best possible applicable modality of IMRT, VMAT, SRS, FSRT, and proton-beam therapy. DeMonte F, Chernov M, Fuller G, et al. Skull base. In: Goepfert H, Ang KK, Clayman GL, Diaz EM, Ginsberg LE, Khuri FR, Suarez P, editors. MD Anderson Online Book: Multidisciplinary care of head and neck cancer; 2002. www.headneckcancer.org.